Whoooooo! It is the week of Halloween and all is eerie quiet, cold and misty. Quiet and cold as the grave in fact. Just imagine you're walking through a murky graveyard late on Halloween night. It's Witching Hour and you hear the sound of solid earth shifting and rotten coffin wood snapping as the dead rise from their graves. Then there is ghostly groaning and shuffling of feet over wet grass, and overgrown brambles and twigs snapping as some paranormal force pushes through years of neglected long forgotten ground. You run for your life stumbling across what you first think is a fancy dress party held in fact by the undead and then of course some zombie wannabe puts Thriller on a beatbox next to the gravestone bar. The undead bartender tells you the best drink on the house, "Stone Dead!" He says, "try it, you'll love it to death!" 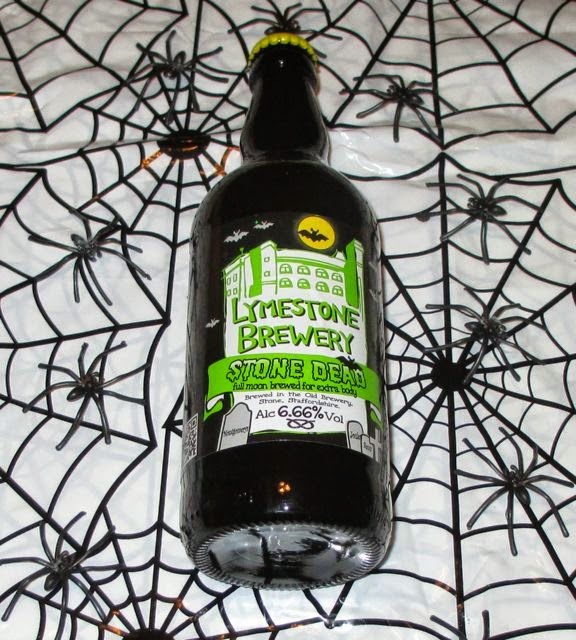 Stone Dead is a stout for the living as well as the undead. This Imperial award winning stout was brewed with Millennium, Nugget and Styrian Golding Hops. The label mentioned roasted malt, coffee, burnt toast and bitter fruit flavours. My tastebuds were dribbling just reading the label! On pouring this almost jet black stout there was a definite roasted malt and coffee smell, with fruity hints and the mixture of hops bubbling excitedly like a witch's brew under the dark creamy head. At first I struggled to keep this stout in my beer mug as it threatened to froth out over the brim. I took a deep sip and was instantly rewarded with that promised roasted malt and a lip smacking dark chocolate flavour. The strong bitterness from the dark coffee hit my tastebuds next, which was closely followed by the throat scraping bramble-berry type fruitiness that nipped gingerly at my throat. This was a full bodied stout, not for the faint hearted bursting with complex flavours from roasted malts and chocolate, to coffee and the fruity bitterness from the fighty mixture of hops, leaving a fruity malty burnt toast type flavour in my mouth as an aftertaste. A pleasure to drink on a cold scary night or any other. Whether Stone Dead or not this black hearted stout warmed me right through and would breathe life even into the living dead! Bwah ha ha haaaa! Produced by the Lymestone Brewery in Staffordshire. 500ml bottle at 6.66% volume (Aaah! The Devil's number!). Contained malted barley and wheat.